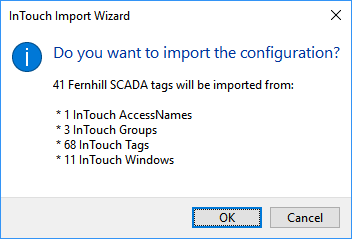 The InTouch Import Wizard imports an InTouch project into Fernhill SCADA. Information: The InTouch Import Wizard provides best effort to import the InTouch Project into Fernhill SCADA. Some InTouch features do not have an equivalent feature in Fernhill SCADA. For example, ActiveX controls are supported in InTouch, but are not supported in Fernhill SCADA. 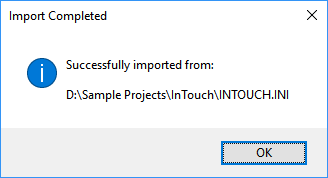 After importing an InTouch project, please read the Import Report. The Import Report lists the feature(s) that were not transferred. In the Tag Window right click on the target folder you want to import the project into. Browse to and select the appropriate Intouch.ini file. If you see this dialog, enter the type of tag you want to create for each access name. Then click OK.
Click OK to close the Import Completed dialog. The InTouch Import Wizard will open the Import Report providing a summary of what was imported from the project. For information about configuring tags. To learn about other features the Fernhill SCADA Configuration Tool.